Activity concentration of 90 Sr and stable strontium concentration was analysed in 42 samples of animal (deer, roe-deer, elk and boar) bones, which mostly originated from north-eastern Poland. Strontium separation was performed by extraction chromatography. Determination of chemical yield was controlled by means of stable Sr determination using atomic spectrometry at the beginning and at the end of the separation procedure. Equilibrated 90 Sr and 90 Y activity was measured using a liquid scintillator spectrometer. Stable strontium range was from 55.4±1.7 ppm to 91.8±4.5 ppm, the mean was 71.84 ppm with a standard deviation (SD) of 9.31 ppm. The mean recovery of strontium was 26.7% with SD = 16.1%. The maximum activity of 90 Sr, equal to 629±13 Bq/kg (ash) was found for a deer sample from Augustów Primeval Forest. In average, deer show the highest radiostrontium level, followed by roe-deer, elk and the lowest level were observed for boar. Differences between boar and deer or roe-deer are significant in terms of Kruskal-Wallis statistical test. Animal bones from north-eastern Poland showed about twice the mean concentration of 90 Sr, compared to those of south-central Poland, but the difference was found not significant. 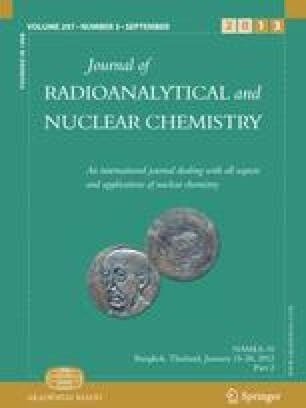 Activities observed in roe-deer bones suggest the deposition of a concentration of 1.9 to 3.5 kBq/m2 in the average of Chernobyl-origin 90 Sr in 1986 in north-eastern Poland.